Will Pound be able for a new High? The past market week was marked by growth of three major currency pairs. Records of the last FRS meeting exerted a pressure on Eur/Usd quotes. FRS stated that on coming December meeting it can consider QE3 cutting. Rumors about a probable introduction of negative rates coming from EuCB were also like oil in the flame. These both factors supported US dollar, whereupon EUR/USD dropped down to 1.3399. Positive PMI data in industrial sector and German IFO supported demand in Eur/Usd pair, which closed trading week at the point of 1.3556. From the one hand, positive statistics from the leading economy of Euro zone is positive for the united European currency, from another hand, the only Germany is not enough to drive European economy. Apart from the records of the FRS meetings, records of the last BoE meeting were published as well. British regulating authority stated that inflation will decline in the nearest months, whereas unemployment will on the contrary drop. It was also stated that increase in interest rates may not necessarily follow right after the target level is reached. Positive data on the balance of industrial orders by Confederation of British Industry also supported cable in pairs with Euro and USD. 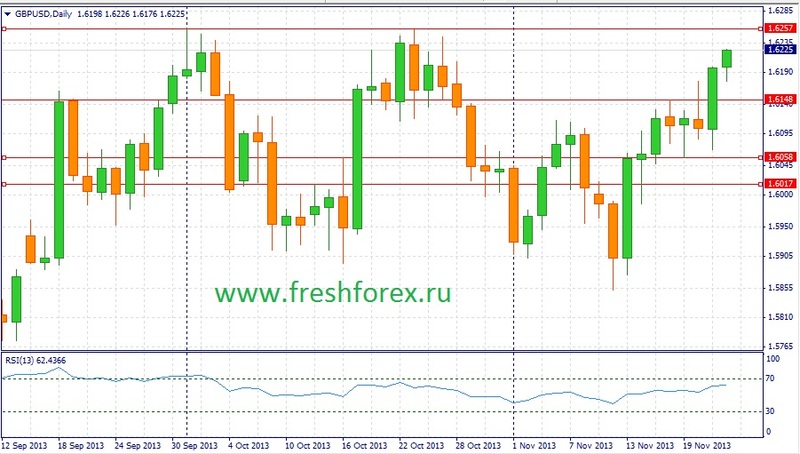 Gbp/Usd closed trading week at the point of 1.6225 closer and closer reaching high of 2013. Meeting of the Japanese CB did not give surprised to participants of the market. GDP decline in 3rd quarter in the rate of 1,9% per annum was marked by the JCB management as a temporary delay. Also it was stated that now it is too early to discuss the policy of leaving stimulus programs. Positive mindset of investors on Japanese stock exchanges encouraged bulls to take new highs. 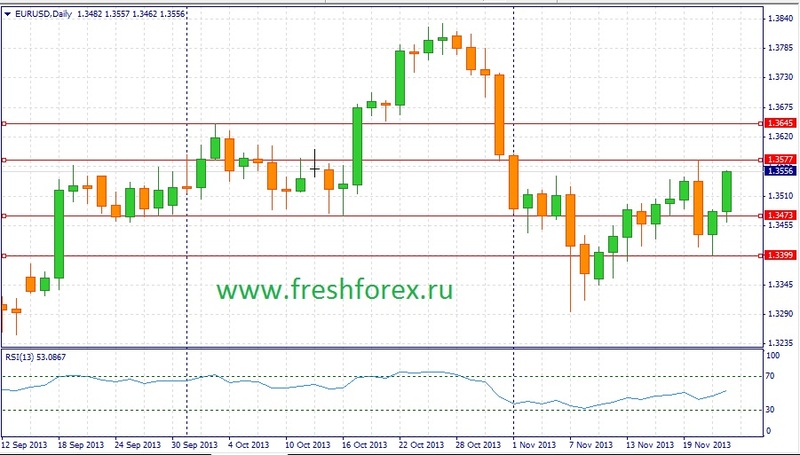 The week was closed by USD/JPY at the point of 101.27. Eur/Usd: Coming week will be short for American participants of the currency market. On Thursday, 28th of November, USA will celebrate Thanks giving day and banks of the country will be closed on that day. Traditionally, liquidity of the Forex market decline and volatility grows on this holiday and right after it. On Tuesday, 26th of November, market participants will obtain construction data, which will be published for two months at once (In October there was no report because of the governmental shutdown). Having analyzed figures impacting on the construction sector, we can conclude that data will either correspond to or will be just above expectations. Release of changes in durable goods orders must also be emphasized. Over the recent time, the USA has mixed news background, thus, we can expect any deviation from expected figures. As for European releases, it is necessary to underline the data on German labor market, Consumer Price Index report and the data on unemployment level in Euro zone. The recent positive reports on PMI, ZEW and IFO can be a positive factor for German labor market that will undoubtedly support euro. Consumer Price Index report and the data on unemployment level are expected to be correspond to the forecast. Though the European Central Bank reduced the interest rate down to the level of 0.25% , there was not enough time to turn the situation for the better. 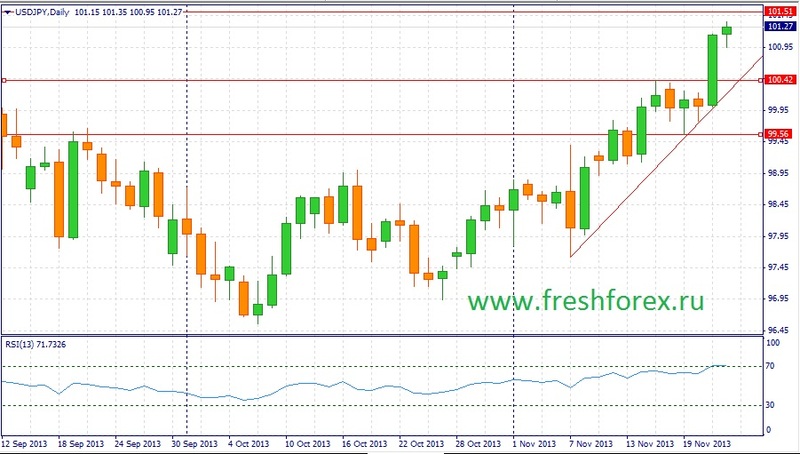 In general, for EUR/USD pair we can expect a flat trend within the range of 1.34-1.3625. Gpb/Usd: On the first trading day of the week, BBA Mortgage Approvals are to be published. Over the last time, Britain provides good data and this time one can expect the figures just above forecast. On Wednesday, 27th of November, the second GDP estimation for the 3rd quarter will be published. Experts told Bloomberg that they do not expect changes to happen and market respond to this report will be minimal. “Cable” may be pressured by oil quotes as well, because British currency is on the list of petrol currencies. Negotiations between Iran and member countries of the UN Security Council resulted in agreement. In this regard, we can witness decline of oil futures. Core event of the week will be speech of BoE Governor Mark Carney on 26th and 28th of November. In the terms of technical analysis, Pound has all chances to continue growth, but growth can be real only upon overcoming a strong resistance 1.6255. In general, we can expect a flat trend for the British currency, which will be within the range 1.6050-1.6280. Jpy/Usd: Japanese Yen will expect report on changes in retail on November, 28th, and Index of Consumer Prices on November, 29th. Having analyzed allied figures, we can conclude that retail data will be released on the medium level of forecast, whereas CPI can be below expectations that will press on Yen. In the terms of technical analysis, after getting through a strong resistance 101.52, the path to 103 opens. Also, Jpy/Usd will depend on stock sentiment. Continuation of growth of stock indices will add positive news for bulls and encourage them to open new long positions. In general, we can expect a moderate growth of Jpy/Usd quotes.